Google updated the OneBox for currency conversion. 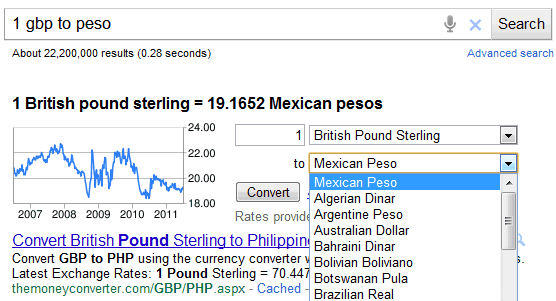 Until recently, when you searched for [1 usd in eur] or [200 gbp to peso], Google displayed the result and that was it. The new OneBox includes a graph for historical exchange rates and an interactive tool that lets you select a different currency from a long list or change the value you want to covert and instantly get the result. A similar tool is available at Google Finance, but it's more convenient to access it from Google Search and you don't need to search for USDEUR to convert US dollars to euros. For some reason, when you search for [currency converter] from the US, Google tries to be helpful and shows that 1 US dollar = 0.6957 euros. Still have the old style. Why? They still only include a handful of the main international currencies in the converter. I've never understood why they don't extend this feature to include all currencies. Hehe, they just completely die when you try to convert to ISK-- I had a friend who relied on that conversion and got completely screwed when he went there, it was off by almost 30% and stuff cost way more than it said. Now, when you try to convert from that box to Icelandic currency, it drops you to a results page! Feature does not work if Google is displayed in another language than English. Google shows that 1 US dollar = 0.6957 euros even when I search from Sri Lanka. We are a Forex Trading Signals organization with more than fifteen years of fruitful exchanging knowledge. We give google forex news and expert coin merchants with exchanging answers for suit their objectives. All our Forex Traders are chosen to give you an abnormal state of stable benefits. They are anything but difficult to utilize and permit you to conform all exchanging parameters as indicated by your own inclinations. But I guess the main problem in dollars to euros conversion is not been known the current value of dollar. For this online converter tools I guess is a pretty good option.